You’re only going to need 3 colors here, Beige for your base, fuchsia and black for the spots. Step 1: Paint your nails a coat or two of your preferred beige polish. Let it dry for a bit before moving on to step 2. 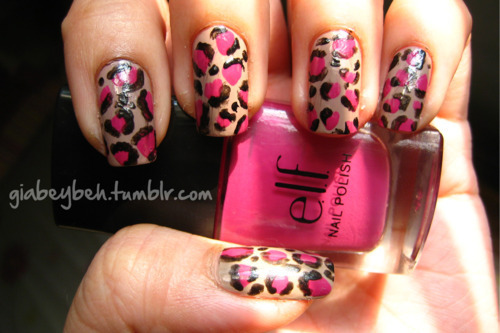 Step 2: take your fuchsia nail polish and make random dots on your nails. You can either just use the brush that comes with the bottle or use a round tip nail art brush to do this, make sure that you make some of them randomly shaped and some of them shaped like an apostrophe. again, let it dry before moving on. That’s it! it’s pretty easy and quick to do.